Phones are getting bigger, we know. Once they reach a certain size, there's less need for a separate tablet. 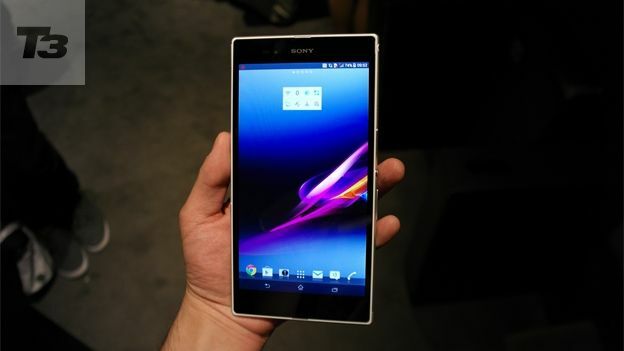 And with the new Sony Xperia Z Ultra, that need is almost completely negated. After all, with the 6.4-inch display of the Xperia Z Ultra, why would you want to carry a 7-inch tablet as well? That's what Sony is hoping you'll think - and certainly Samsung has had big successes with its Note range - most recently the Samsung Galaxy Note 3. Meanwhle, the Nokia Lumia 1520 6-inch device has just been unveiled, as well as the HTC One Max. But this screen is a lot bigger - is it a phablet too far? It may be big, but the Ultra is so slim it fits in the hand easily enough - though it's not for the tiddly fingered. It's also light - much less than a 7-inch tablet like the Nexus 7 or the iPad mini for instance - and the slightly curved edges also improve the hand feel. It weighs 212g, so much heavier than most phones, but not impossible. Size wise, stat fans, it's 179.4 x 92.2 x 6.5 mm and it's the 6.5mm thickness that really makes the difference. The glass back is similar to the Sony Xperia Z1 smartphone and makes the phone feel premium and classy. It also has the precision-milled power button on the right edge, as introduced on the Sony Xperia Z. This one is halfway down the side - a concession to the phone's length. The only downside to the design, really, is a necessity of the waterproofness. To keep the wet out, all the sockets are protected by flaps. These are a faff to open and close and can feel a little fragile. Actually, the headphone socket doesn't have a cover, it's waterproof inside, which is good as you may need to use it a lot. And if you have the special charging dock, it attaches to two contacts on the side which are exposed. For most of us though, opening the flap on the microUSB socket to charge the phone is unavoidable. Being waterproof is one of Sony's signature features and it sets the company apart from rivals. Whether you're watching movies in the bath or texting in the rain, you're okay with the Z Ultra. The screen keeps working when the phone's underwater though of course the touchscreen can't function when submerged. And for the rest of the time, it's just handy to know that spilling coffee on the phone, or getting it wet some other way won't damage your valuable electronics. Sony specialities on the Xperia Z Ultra include Track ID, Sony's own, very capable, alternative to Shazam. And there's Music Unlimited and Video Unlimited, Sony's music and movie download or streaming stores. Sony's take on Android is elegant and demure - none of the brash, colourful icons found on Huawei or LG phones, for instance - and it looks great. Similarly, the Rolodex type display for photos on your phone is fun to use and well executed. This is a big display. It's full HD resolution, though obviously the pixel count per inch is lower than on the HTC One, which has the same resolution, but on a smaller piece of glass. Even so, the screen here looks good, not least thanks to input from the Sony TV division, which has provided knowhow. It's rich and detailed with colours that are subtle and realistic rather than garish or over-saturated. And with a screen this size, chances are you're going to watch more than just YouTube clips, though The Lord of the Rings may still prove a challenge. The sound on the Xperia Z Ultra is less impressive through the speaker, not least because it's waterproof, but more than good enough via headphones. Sony's skill with cameras on phones is undeniable. The sensor here is 8MP resolution. Sony has put 13MP snappers in recent phones but this is still a decent camera with a neat interface and a sophisticated auto setting called Superior Auto. There's also Burst mode, picture effect and another Sony feature drawn from the company's regular cameras: Sweep Panorama. But there's no flash on this camera - a surprising omission. True, flash ruins most shots anyway, but sometimes it can help a little. Sony says the camera works well in lower light situations and it largely does, but it's a shame there's no flash here. Though the results aren't as outstanding as phones like the Nokia Lumia 1020 or the iPhone 5s, this is still a capable camera that's easy to use and works well in decent lighting. This is a fast phone. The quad-core processor and 2GB of RAM translate into dawdle-free use and - importantly for a phone this big - butter-smooth video playback. With phones increasingly well powered, such as the lightning-fast iPhone 5s, under-specced phones look poor. Thankfully, the Z Ultra is nippy. A phone this big has room for a decent battery. It's a 3000mAh cell and it keeps it going happily for ages. The usual warning of daily recharges is worth noting, but this phone has stamina. Speaking of which, if you do spot it flagging there are Sony's special Battery Stamina settings to eke out extra life. The elephant in the room with phones this size is how do they feel when you clamp them to your ear to make calls. This is the biggest phablet yet, so it's no surprise it doesn't make for comfortable usage. You almost feel your mouth is so far from the microphone you need to shout. And there's definitely a touch of the Dom Joly about it. It looks great, it feels good in the hand - but it may just be too impossibly big to make phone calls in comfort and without embarrassment. This is a highly capable phone with lots going for it from strong battery life to decent Sony apps, a gorgeous screen to excellent styling. But you do need it to make phone calls, don't you? This is a phone that's worth trying in your hand(s) before you plump for it. If the size isn't a problem, this is a great phone - and the waterproof feature is a cool extra that makes great sense whether you're clumsy, eager to show off down the pub, or a mermaid.